“due process of law”, “equal protection of the law”, “fair trial”. There has been an extreme amount of constitutional discrimination in this case. Tocholke is not an attorney and knows little about the law. Because public defenders in Wisconsin are not allowed to provide representation for family court cases, the person that is too poor to hire a regular attorney becomes a victim of the system. That victim must do everything pro se, which in itself becomes an unconstitutional discrimination. If the victim only has a high school diploma, is not an attorney, does not know how to file all the required papers with the proper formats, too broke to hire an attorney, and cannot get a public defender even though they have been criminalized; tell me what must they do to get justice? This case falls into that bracket. The Court of Appeals has rejected his best effort of complying with the Rules to be able to secure a fair trial. This is his main issue. He is not asking for the Wisconsin courts to allow him to present his case and arguments in any which way that he so chooses by disregarding cover colors or the length that he does understand. However, if he does NOT understand what “mono-spacing” is, or is ignorant to some format technicality, would it be a Constitutional violation to deprive him a hearing if he was unlearned in that area? Is the U.S. Constitution, Amendment 14 exempt from the ignorant poor citizens? The common citizen can easily read and understand his Motions and Brief. Even though they are uneducated in the area of law, why can they comprehend what he is arguing about, but the Circuit court or the Court of Appeals claims that his brief “lacks clear and rational arguments, supported by relevant legal reasoning and authority”? (Exhibit A, page 7) If his petition gets rejected that is presented here, this whole concept of “equal Protection” and justice in America will only be a myth. Justice then will only be to the rich, or to the attorneys. Citizens that cannot afford an attorney must suffer the horrors of whatever the American courts decide to do with them without any remedy of justice. Rejection of facts to avoid due process of fair trial. If his petition DOES get accepted by the Wisconsin Supreme Court, his brief will include the transcripts of constant rejection of facts and denial of statute provision and opportunity for case revision Wis. Stat. § 767.59. For nearly a decade when he brought up the right to recalculation, the judges said things like, “We are not going to adjust anything”, “What was established, I am not going to change”, “We are not going to correct anything from back then, we will only discuss what is from this day forward”, etc. Regardless if Tocholke could prove a mistake or not, the Judges would never consider looking into what was established nearly a decade ago. One point that he wants to add now is that he did not let nearly eight years go by before he is trying to do something about it now. He has brought up this issue probably at every hearing, but was rejected or silenced every time. Suppose that a contractor gave a bid for a job, and priced it at a $1,000. Let us say that he had to rent some equipment. He also was going to use some of his own equipment that he was making monthly payments on. There is also fuel cost and other expenses in order to do that job. If according to a certified tax accountant he spent $500 to do that $1,000 job, “how much Adjusted Gross Income (AGI) did he make?” According to the IRS and the certified tax accountant, he made a $500 AGI, which he must pay taxes on. Controversy: The Circuit court and the Court of Appeals have consistently argued that Tocholke would have made the full $1,000. The judges that ruled on his case are not accountants but have consistently ruled against the decisions that the IRS and the accountants have established. (Exhibit A, page 6) They have labeled him for an income that is contrary, to not only the tax professionals, but also to the understanding of the common citizen. Why can the uneducated citizens see the error, while the judges so far have refused to understand? If Tocholke must take his appeal before the federal courts, he will definitely order for a jury trial that will easily understand these basics principles. Now let us elaborate one step further. Suppose that the judge incarcerated someone wrongfully and financially destroys them. Once released the ex-prisoner does not own any equipment since it was lost during the incarceration time. If the person now wants to do a job that he was experienced in, he will have to rent every piece of equipment. Renting is more expense per day by a lot more than making monthly payments on it. But then there is one more problem in this situation. He was incarcerated and lost everything, including his advertising. He had signed contracts with newspapers and yellow pages to advertise his business. Regardless that he was trying to pay what he could, the judge still threw him in jail. While in jail and not making a penny, he defaulted on ALL the contracts. Because of that he was restricted from advertising with them unless he could pay the entire cost up front, which he couldn’t. Due to that situation, he can not afford to lose any potential customers by guessing at an estimate too high. Suppose from a combination of second-guessing the estimate or the customer hesitating at the price he gave them, he drops the estimate to $800. Did he give them a 20% discount? The original price was a $1,000. What the customer, and especially the circuit court could not (or did not want to) comprehend was the reality of what that entails. Regardless that the estimate dropped in price, the cost to do the job is still the same. Take the 20% discounted price of $800 and subtract the $700 that it takes to do the job, and the contractor makes a $100 AGI! Before he was destroyed he could have charged $1,000 because he had plenty of work. Deduct the $500 for the equipment and some rental, and he has a $500AGI. After incarceration though, he is scared of losing the little amount of work that is coming his way, and drops the bids 20%, but actually lost 80% of his AGI! Final thought: Is it a Violation of Judicial Due Process, when a judge that does not have a degree or license in tax accounting, but rejects the statements of what the IRS and the certified accountants accept in calculations? Why is correction of extreme importance? Because the child support was set originally at Tocholke’s total AGI income (100%), he fell behind very quickly. Once behind, the courts did not change the error but instead threw him in jail which only destroyed him worse. Child support never quit while he was incarcerated even though he did not even make one penny during that time. Then when he was released he not only had defaulted on everything but he also had huge arrearages that prevented him from getting any loans to help him make a living. Not being able to buy a reliable car hinders the task of securing a profitable job. Being that far behind on child support (which was a direct result of the courts decision) only created the unavoidable wrongful incarceration the second time. There was the same repeat of not making a penny while incarcerated while the judge once again refused to stop child support during that time. After spending an entire year in jail and seeing the outrageous arrearages increase besides also the other bills that he went deeper in debt with, makes the victim give up to even try. However, that is not the answer either since the wrong calculations are constantly haunting the victim ready to incarcerate him again at any moment. Tocholke had to file this Petition to avoid getting ordered back into the circuit court where he would be sentenced to jail or possibly even prison this time for a year or two. If the Supreme Court rejects his Petition, he would have to immediately file at the federal courts, once again not out of choice, but forced to avoid false incarceration again. He MUST APPEAL forever or he will be in jail again. He is too broke to pay the errors and mistakes, and he can’t sit back and hope the problem will go away. They will not! He has no choice but to appeal or spend the rest of his life in jail. In (Exhibit A, page 8, second to last paragraph) Tocholke finds a disturbing sentence. “See id. Placement of the children, travel expenses to accommodate the placement schedule, Shereen’s move to Ohio with the children, and the children’s education while placed with their mother in Ohio will therefore be addressed no further on appeal.” Is the Court of Appeal eliminating the position of the Wisconsin Supreme Court? Are they claiming that they are the final authority for appealing a decision? That statement should be disturbing to the Wisconsin Supreme Court also! This seems to be ironic in the contradiction that attorneys and judges are supposed to be fact finding in order to find out truth. However, here the previous courts are condemning to allow a look at how the issues developed to understand how this point of controversy transpired. How can the reader decide who was at fault by just reading only the last chapter of the book? The reader only reads the last action without understanding how it came to the final showdown. It is not even judicially coherent or logical to condemn the history of the case in order to decide the present. Daily criminals are tried for the crimes they commit, and each time the history of the individual comes on display. Sure the criminal will not get a new charge for past conduct, but his past conduct is considered to give the appropriate judgment. Therefore, Tocholke petitions the court to do the proper judicial thing of looking at the how things developed to know how to decide the case at hand properly. In order to get an understanding of what has gone on in this case let us examine the turbulence that is under the surface which cannot be seen. As already mentioned in the previous issue, he tried his best at continually presenting these issues at every court hearing. This entire case and its issues, he had tried to never let sit dormant. It was the courts that have continually postponed court dates and rejected to address the issues. Here is the brief overview now. IS THIS JUDICIAL DUE PROCESS or a FAIR TRIAL process? May 6, 2002, Commissioner Plous creates the errors in calculations as described. He is not an accountant or has a license to practice tax accounting. From May until October Tocholke had an attorney that sold him out. Since Tocholke was ignorant, the attorney took advantage of him. Example: He urged Tocholke to sign the Marital Settlement agreement, telling him that if he did not sign it that he will lose the two boys in his custody. He told him that the boys would have to go with the mother that is in a cult, and where they also were beat by the pastor and his wife. The attorney put such fear in him that he signed the paper reluctantly. After he signed it he learned from other attorneys the consequences of signing that form. He would be held captive to that agreement for two years. That is not entirely true either. Reality is that the Circuit court and the Court of Appeals is still holding him to that contract signed in 2002. Because he signed that contract they took the right away to ever appeal the conditions although it is allowed by the statutes. He went to several attorneys and all of them were in disbelief of why he would sign something like that. Why did he do it? He told them it was because Attorney Ward told him that, “this was the best we can do”, and if he did not sign he will lose the two boys. They replied that he did not get a good deal but was taken advantage of, and that he must live with it now for at least two years! October 2003, Judge Wagner orders him to take one of three choices. 1.) By the next court hearing he would need to be current on child support, (which he could not) or 2.) Secure proof of five job searches for every week, (which he could) or 3.) Have another job by the next hearing, (which he did). This was said in the courtroom by her, and referred to twice in later transcripts. However, it was deleted from the transcript in which it was said. Is that lawful? March 2004, even though Tocholke had worked at another job since November, Judge Wagner accused him of spitefully quitting his other job (it was her orders), and switching jobs out of defiance. She ordered him to be incarcerated. At the time he had paid $18,000 in 22 months but was ordered to jail anyway! Minor children devastated! Before Tocholke was actually hauled away in handcuffs, he asked Judge Wagner about what is going to happen to his two boys in his custody in Minnesota. She stated that the 15 and 16 year old boys are old enough to take care of themselves. They are old enough! Randy, the oldest boy, had to quit school to do a part time alternative school, and then work most of the remaining time at a farm to be able to support his brother and himself, while his daddy was in jail! Was that proper Judicial Due Process? Tocholke never got a penny of child support for the two sons in his primary placement. To keep the scam from surfacing, the boys had to be placed against him. The other county admitted that this is a mistake but that they can not change it. They said that it has to be changed in Kenosha County. When Tocholke went to the Kenosha Child Support, they told him that HIS mistake can only be changed in the courtroom. Everybody else’s that he knew could be changed by the Agency. Why was his different? In jail he filed an appeal to the Court of Appeals. He understood that if he was incarcerated that the courts must give a lot more tolerance for format requirements. However, the common citizen must follow all the complicated rules. In that respect, the poor ignorant, non-lawyer victim would be better off in jail during the time of appeal. Judge Wagner knew that too and immediately released him after only doing three months of his six months that she had ordered him to do. Was it proper Judicial Due Process or lawful for her to do that? Once released, he was obligated to file his brief in the complicated lawyer style and required format. Of course he would fail the requirements since he is NOT an attorney, and could not hire one or get a public defender. Yes, they did reject it! July 2004, He immediately filed another Order to Show Cause, in hopes of correcting the mistakes and to make other adjustments. September 2004, He was coming to the court building and saw an individual acting as a sentry. Tocholke noticed the sentry make a double take when he spotted him. The sentry spun around and ran into the court house. Assuming that this was not good, Tocholke ran for the court house. As he dashed into the building, he could hear the sentry already about two floors above him. Tocholke sprinted two or three steps at a time, and as quickly as he could. When he reached the last flight of stairs and gaining on him, he heard the sentry enter Judge Wagner’s courtroom yelling, “He is here, he is here! !” The door was still swinging back and forth when Tocholke burst into the courtroom. As he entered the courtroom, he watched Judge Wagner run out the side door. From behind closed doors she had him ordered to finish his six months of jail, and also deprived him of his scheduled hearing!! He never did get that hearing. Was that proper Judicial Due Process? It was a hot summer day when he had been arrested and was also deprived the scheduled hearing. He finished his six months and was released just before Thanksgiving 2004. However, it was well below freezing and in the middle of the night. He was over 400 miles from home, with just a thin summer shirt, with no money and no transportation. If it had not been for the permission from the Sherriff Department to spend the night in the entrance foyer of their building, he would have froze to death. He slept on the tile floor like a dog, but then dogs have a mat to sleep on. He was not that lucky! Through out the next few weeks he found out his devastated situation he was in. His vehicle and everything he once had owned had been repossessed. What ever could not be repossessed had collection agencies all over it, who have hounded him even to this day. His credit score had dropped to 430! He also was homeless! Suddenly in the fall he started hurting really bad, and was extremely tired. He could literally sleep twenty hours a day, and still could not stay awake. After he hurt so bad that he could barely move, he went to the emergency room. He was diagnosed and treated as a 100% Lyme disease victim. It took a while to recover. However, by spring (2006), he was back to being dead tired again. He could not work. Once again he was diagnosed and treated for Lyme. He hurt and acted like a very old man. During this entire time, Tocholke kept sending letters to Judge Wagner requesting the hearing that she had deprived him of. He had requested for her to dismiss herself from the case, but she refused to. After making things personal, by sending her husband who is a city counselor a letter, asking him to give Tocholke advice on how to handle a corrupt judge, she immediately recused herself. Excellent! Clean slate/fresh start! September 2006, He immediately paid and filed for another Order to Show Cause hearing. Commissioner Plous that had established this whole error immediately recused himself. Commissioner Fitzgerald immediately did the same. Judge Milisauskas wrote Tocholke a notice that Judge Schroeder should take his case, since it could be regarded as his jurisdiction. Judge Schroeder quickly responds that it is clearly Judge Milisauskas’s hearing. Question: Kenosha has several branches and courtrooms which handle different cases. They range from family court, to civil, to criminal, and also juvenile. Was it proper subject matter jurisdiction to place Tocholke’s case into the criminal courts jurisdiction? Did they violate personal jurisdiction when they placed his family case with judges in the criminal courts? Could they have violated territory jurisdiction assigning a criminal court judge, which is bound by state boundaries, to judge a citizen of Minnesota? Also was there a violation if Tocholke does not ever recall getting read the Miranda Rights when he was arrested. Sure he was in court when he was arrested, but the one time the judge ran out of the room, and deprived him his hearing. If he was not read his rights, was it legal? However, if he WAS read his rights, it mentions that he “has a right to an attorney”. Is that the reason they do not read the rights to a family court arrest? Ironic how crafty Judge Milisauskas acted. He rescheduled the hearing to March, but recused himself immediately in December 2006! Tocholke’s case was turned over to Judge Schroeder in January 2007. Was it proper Judicial Due Process for the courts to never notify Tocholke that Judge Milisaukas recused himself, or that Judge Schroeder had his case, or that Judge Schroeder would not honor the hearing that was scheduled or established? Tocholke spent time and money to travel nearly 900 miles to come to a hearing that did not exist! Notice: Tocholke paid and filed the Order to Show Cause in September 2006. He finally received a hearing in Judge Schroeder’s courtroom in May 2007, eight months later!! Was that proper Judicial Due Process? In that hearing however, the judge seemed fair. He made a big issue out of the illegal school that the defendant, Shereen Tocholke is placing the minor children in. Judge Schroeder demanded that they be tested by the state to see if she is abusing the system. He also ridiculed Bernard Tocholke on his lack of income but refused to make any changes that day regarding child support adjustment based on his income. Case rescheduled to July. July 2007. It was as if there had been some conspiracy taken place since the last court date. Because of sound system problems, the entire courtroom group involved with the Tocholke case where ordered to hold this hearing in the back private chambers. Immediately Judge Schroeder orders his court stenographer or transcript typist to not take any notes. Every thing was ordered off record, and there will not be any transcript for this hearing. Was that legal? If he denies that he made that order, he should be able to prove me wrong by producing the transcripts then. There are none! (see Exhibit C, page 20) We could polygraph everyone in the room to see if that was said. As soon as Tocholke was ordered to present his case, he started with what he knew was a hot topic for the Judge just two months ago. Tocholke mentioned the illegal home/private schooling that the judge had been so upset at. In Tocholke’s amazement he simply dismissed that with barely a comment. Why all this change? Tocholke then brought up the child abuse and beatings that are taking place in his ex’s church/cult. I do not know how to get back to the previous Microsoft format. I will start a new set of numbering to finish this over view of what happened in the court rooms during this case. When Judge Schroeder elaborated on that, Tocholke knew that he will never get justice in his court room. Tocholke requested a change of venue for a different judge, but was denied. Having no right in choosing the venue of anything, is that proper judicial due process? For five years he had tried to get more time with his five other children. He could only get them for 1 ½ days a month. To the common citizen (and a jury) it would be regarded as extremely unfair. However, each time he brought it up in court, the idea was rejected. If he gets accepted in this court he will in his brief present the transcript proof for that. It was demanded that he do all the driving. He lived in Minnesota and Mrs.Tocholke still lived in Wisconsin. It was demanded that he pick the children up Friday noon, and have them back by Saturday evening at 8:00 pm. He had to drive about 900 miles (combined both ways) Friday, and arrived back home to Minnesota that evening to allow his two boys to enjoy their siblings for the rest of the evening. The placement continued into Saturday morning until noon. They did not even get to enjoy each other for 24 hours for each month! At noon Tocholke had to take his children back home again. He drove another 850+ miles to take them back (round trip), and then start his return trip by himself at 8:00 pm Saturday evening! Why did he have to spend about 1700 miles for just 1 ½ days placement? Why could not the courts rule that there would be shared driving? Was it due process to get rejected every time? Those were the main issues although there were some other minor points. September 2007, he knew he was not going to get justice in Judge Schroeder’s courtroom after what he went through in the last July hearing. He could not change venue either. Tocholke also was very much afraid of the potential of going back to jail. Even though he did not know what he was doing, he filed for a violation of due process lawsuit in the federal courts. Tocholke made a lot of mistakes in the filing. However, he believes that the filing was the only thing that kept him from going to the jail for that hearing. He believes that Judge Schroeder would have put him in jail if he had not filed the lawsuit that day! Have proof of 5 job searches per day! That is a full time job! (25 job searches a week!) How could a criminal judge have jurisdiction over a family court victim that lives in Minnesota with an unreasonable set of demands? Was that reasonable and proper judicial due process? The judge, the opposing attorney, and the GAL had all turned against him. It was like a conspiracy and he feared that he was going to jail if he was not reasonable with some things. Shereen Tocholke had petitioned the courts to allow her to move from Wisconsin to Ohio, which would be a fourteen hour drive for Mr. Tocholke to see his children. The judge was angry with him for not agreeing with that move. He ordered all the people involved in this case to litigate about that in the back room. If Tocholke allowed them to move, he would rarely see the children ever again. November 2007, fourteen months after he filed to get things changed, he walks into the courtroom. Judge Schroeder immediately asked if he had applied the $5,000 which he did not have. Was it a Constitutional violation for him to demand something that was excessive and out of his reach, Amendment 8?? Now going job searching with that typed paper, he could secure the required job search proofs. Like it was mentioned, he spent days at getting over 250 of them, but Judge Schroeder refused all of them! He probably has them destroyed by now. Once rejected, he simply threw Tocholke in jail. Tocholke asked if he could move his vehicle off the street. It would not be able to be parked there for six months. The Judge refused to let him do that, and so Tocholke lost that vehicle. It was discarded while he was in jail. This case literally took away “life, liberty, or property, without due process of law” or a fair trial. Tocholke has spent an entire year total in jail. In jail he made absolutely NO money during that year. When he was incarcerated, he sent the court a motion to at least stop the child support during his incarceration. Judge Schroeder refused to consider that. Tocholke made absolutely zero money but child support was increased during that time by about $10,000 more. There was another important document that the judge never signed. In the court records, the Judge mentioned that Tocholke was entitled to Huber privileges. He knew that Tocholke was not from Kenosha County. He knew that Tocholke worked up in northeastern Wisconsin as a logger. Washburn County Sheriff Department did a background check on Mr. Tocholke and permitted him to be transfered to their jail. They provided all the documentation. The Kenosha County Sheriff and jail required a signature from the judge for the permission for Tocholke to transfer to Washburn County. Tocholke wrote letters to Judge Schroeder requesting that permission. Each time the Judge would take days before responding and then with only a short sentence in the fashion that Exhibit B was done. However, he permitted it but never signed his statements. The six months eventually eroded away. He never was transferred. His boss got frustrated with it and sold the equipment (2008). Tocholke lost the job that he had held for a few years. From his release until now, he still has not been able to secure a steady job like that one that he lost. Today he could be considered more of a full-time college paralegal student, with a part-time work schedule doing whatever plain labor he can find, enough to keep from starving. He wrote his brief while in jail and submitted it around February of 2008. Why did he get rejected for style or form when he was incarcerated and had no other options? He is not an attorney. He could not get a lawyer or a public defender. And yet he is held to the standards of an attorney while sitting in jail. The Court of Appeals rejected his brief the first time. He was released in May 2008. He quickly got the brief typed up in the best way that he knew how. It had a much better appearance and submitted it again. If they do not want to accept it, have them use the one he had written with a pen while incarcerated. They must accept that since it would be a discrimination to say, “with liberty and justice for all”, and exclude the innocent prisoner that does not have access to a typewriter. STATEMENT OF THE CASE Tocholke is NOT an attorney. He can not afford an attorney, nor can he get a public defender. He has never been able to get a fair trial in either the circuit court or the Court of Appeals. He has had a judge deprive him of a hearing by running out of the courtroom. He has had a judge tell him that it is permissible to beat children with sawed off golf clubs! Tocholke just desires and begs to get a fair hearing at the Wisconsin Supreme Court. NATURE OF THE CASE It started out as a family court issue, but it is turning into a civil matter where he can not get a fair trial because he is not an attorney and gets manipulated because of his ignorance in the area of law. He urges the Supreme Court to grant him a hearing so that the statement, “nor deny to any person within its jurisdiction the equal protection of the laws”, can be regarded as truth in the State of Wisconsin. Tocholke is sure that the defendant will argue the point that certain issues have expired time wise. In reality, it is a continuation of violations which have become a pattern. He is presenting the entire pattern as a pattern for review. PROCEDUAL STATUS Tocholke believes that he has covered how things developed along the way, fairly well already. This is supposed to be just the petition to urge and beg the Supreme Court to take his case, not to present every proof, fact, and argument about this case. Therefore it is not exhaustive and he plans to present the facts using the transcripts in his brief if he gets accepted by this court. WISCONSIN SUPREME COURT JURISDICTION , The question now is if the Supreme Court has jurisdiction since this Petition includes so much of “judicial due process” and Constitutional violation material. That is true. However, this Petition is to exhaust all the state options at getting a fair trial or hearing of deciding on the issues presented. For nearly a decade, the judges have rejected the facts and based their decisions on assumptions and opinions of what they believed the appellant could make, without any proof to back up their claim. 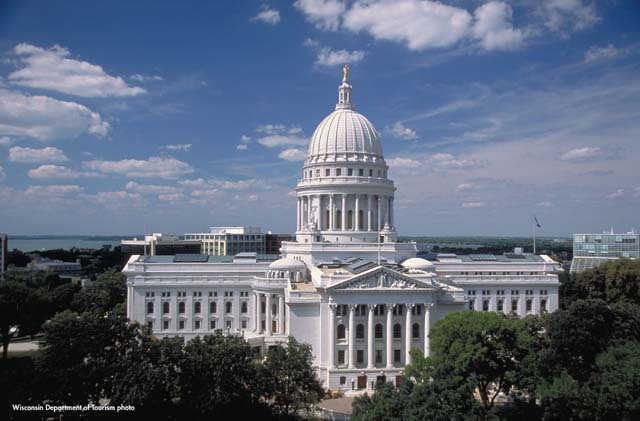 Once the Wisconsin Supreme Court makes its decision it completes all the options at the state level to get a hearing to decide on the issues. After that it changes into a civil case of a violation of Judicial Due Process filed at the federal level. That case does not have jurisdiction in the state courts since it is a U.S. Constitution violation and deals with the civil rights. PROXIMATE CAUSE and CAUSE OF ACTION , There is no remedy for the court to take unless there is a concise concept of the cause of action. The cause that Tocholke regards, is the idea that he has been constantly rejected a fair decision of the issues that he has presented. The state courts have either refused to look at the issues and spoke their ideas based on assumptions concocted from their own imaginations, or silenced him if he was trying to make a point, or rejected his entire appeal because it did not match the format that they desired. How can he battle the format argument when he is NOT an attorney? He has lost property, freedom through incarceration, emotional abuse, and financial devastation. He lost a business twice due to the false imprisonment. He lost his children at present which placement was never enforced. When he sent a Motion to address the issue of spousal alienation, the circuit court replied that he does not have merit to bring that argument into the court. He was pushed into homelessness each time he was incarcerated. Presently he is struggling to exist in just keeping from starving. He has never recovered from the last incarceration. In the last few months, he is becoming a criminal with felony charges because of poverty. Because the courts destroyed him, and also because of the poor economy, Tocholke can not find steady employment like he once had. Because of that he is struggling to just survive. However, because of poverty, he has not been able to make steady child support payments. Is it proper judicial due process, to have the courts knock someone down financially, never adjust child support according to their destroyed finances, but then place contempt and felony charges against them? The list goes on of the trauma that was inflicted on him. There has to be some compensation for all of that. Tocholke heard and read a lot of encouraging things about Chief Justice Abrahamson being an advocate for pro se individuals. He used some of her decisions in the Brief that he submitted to the Court of Appeals. He wants to give the Wisconsin Supreme Court an opportunity to hear his case. He wants to exhaust ALL the state options before he moves on. Since March 2009, Tocholke has gone to college full-time taking up an Associates degree in paralegal. The reason for that is to learn how to appeal his case to higher courts, basically for self defense. Actually he was forced into a $30,000 FAFSA school loan so that he does not have to spend the rest of his life in jail. The first two terms were not really that beneficial for the appeal or skills that he was lacking. Yes, the writing classes were fun, but he needs the knowledge of taking this case to the proper channels. Tocholke is finally getting into the meat of what he needs. He just started “Civil Litigation” and “Introduction to Legal Research”. Doing this Petition in this court is actually buying him time, so that he can have time to learn and understand the techniques needed to file at the federal level if this court denies him also. This petition might (depends on this court) only become the necessary stepping stone to file in the federal courts. Tocholke only wants to make sure that he has exhausted all the state options. So if he has petitioned here, the Wisconsin Attorney General will not be able to argue the issue that he did not give the state the option to correct the mistakes and errors. Why did the circuit court place such hardship on me, defying the basic definition of judicial due process? How can they justify disregarding Primary Mandatory Law, in actuality the Constitution and Amendments themselves? However, maybe I am just mistaken by thinking that a lot of things are wrong. Maybe the issues or things that happened in this case are permissible. In that case I will waste my breath in the Federal courts also. However, I will request for a jury to decide that. All these intentions will only happen if I get rejected at this court.